In a tribute to Israel’s soldiers and terror survivors, 2400 men and women attended a Gala event on September 14th, conceived and executed by Hadassah International Israel (HII) to raise funds for the Rehabilitation Department at Hadassah Mount Scopus. “Aba, chaver amar li lichtov shir alecha.” “Dad, a friend told me to write a song about you, about everything I saw in your eyes, about the calm without words, the scents, the sounds, all of it beautiful in your eyes.” The words and music filled Tel Aviv’s Culture Palace-Charles Bronfman Auditorium on this night to remember, a highlight of the innovative activities of HII, which has taken up the charge to bring vision and resources to the Hadassah Medical Center. The event raised two million shekels, besides a gift of one million dollars from the International Fellowship of Christians and Jews (IFCJ) to provide equipment for the rehabilitation center on Mount Scopus. 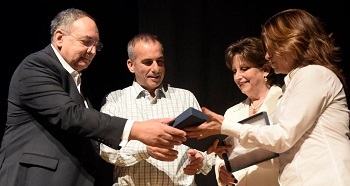 Jeff Kaye, a representative of Rabbi Yechiel Eckstein, head of IFCJ, was presented with the Hadassah Defender Award by Hadassah International President Joyce Rabin, honoring the group’s dedication to Hadassah Medical Center. 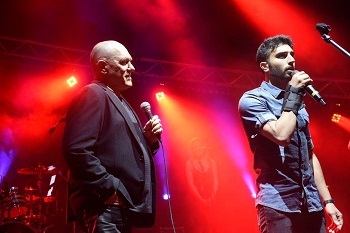 In addition to its million-dollar donation, IFCJ sponsored the event with a gift of $100,000. Levtov, 23, a paratrooper in an elite unit that took part in the hunt for attack tunnels inside the Gaza Strip during the Protective Edge operation of 2014, was severely injured. He spent many months at Hadassah Mount Scopus‘s rehabilitation unit, fighting to regain the use of his arms and legs. Levtov received a range of therapies: physical, occupational, hydrotherapy, and emotional. “If the initial surgery and recovery is a sprint, then the long hard work of rehabilitation is the marathon,” said Dr. Osnat Levzion-Korach, Director of Hadassah Mount Scopus. The Hadassah Defender Award was presented by Joyce Rabin, President of Hadassah International, to Jeff Kaye (second from left), representing the International Fellowship of Christians and Jews (IFCJ). 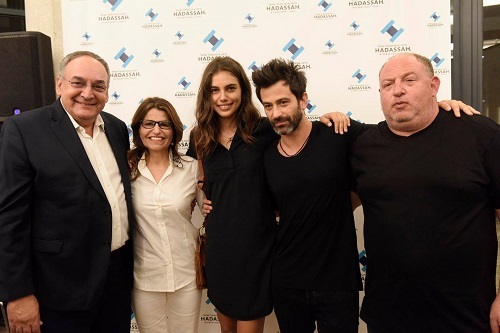 On far left is Prof. Zeev Rotstein, Director General of Hadassah Medical Center; on far right, Dalia Itzik, Former Speaker of the Knesset and President of Hadassah International Israel. Aside from Mr. Shabat, the evening’s program featured Stand-Up Comedian Shalom Assayag. Former Knesset Speaker Dalia Itzik, Chair of Hadassah International Israel, sent blessings for a full recovery to former Israel President Shimon Peres, who suffered a stroke earlier in the week. HMO Director General Prof. Zeev Rotstein brought greetings from the staff members of Hadassah and stressed their commitment to renewal of Hadassah as Israel’s outstanding medical center.